The Crown Series features shed North American Deer and Elk antler crown/burr handles and the series features 15 designs. Every style is accompanied with a handmade leather sheath and limited life time warranty. Handmade in America by American hands. 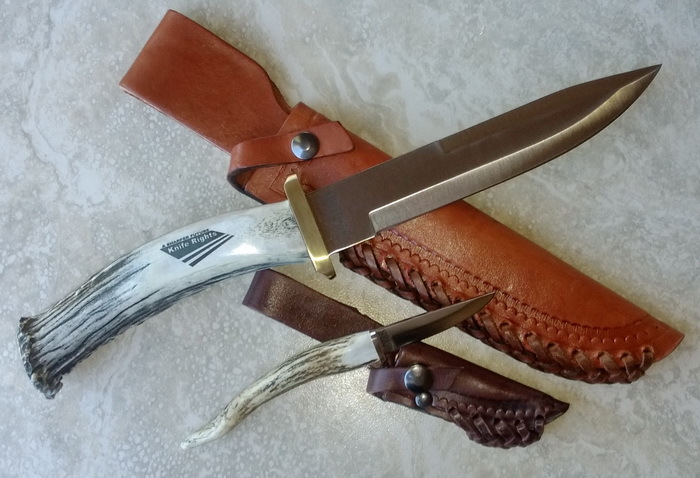 SILVER STAG Knives are manufactured by a small team of skilled Blacksmith’s and Sportsmen. What differentiates SILVER STAG cutlery is the companies “Hands On” approach to manufacturing. SILVER STAG Knives are not mass produced production knives. Rather each and every knife is hollow ground, assembled, shaped, polished, and sharpened “Free-hand”. While no two finished knives will ever look exactly alike, all SILVER STAG Knives share certain features that make them extraordinary field tools. To start, the blades are designed by sportsmen and are exceptionally practical. The blades are manufactured exclusively from domestically produced High Carbon steel. Authentic North American antler is built into every design. The finished knives are stunningly attractive, incredibly functional, and extremely durable. In summary, the team at SILVER STAG has taken a step back in time when high quality tools were handmade in America by American hands. Our steel is purchased directly from American Steel Mills. The blades are profiled by the company’s in-house CNC Water Jet Cutting machine. The Water-Jet mixes cold water with a garnet, and then pumps it through a small orifice at 40,000 PSI. This cutting process does not over-heat the steel, (unlike plasma or laser cutting machines). The scale on the blade is removed with a Surface Grinder. The next and most important stage in the blade production process is the hollow grinding. This is preformed “free-hand” using Beta belt grinder machines. The hollow grinding process is an art that takes a keen eye and steady hands. The grind plays a critical role to the overall functionality of the blade and will impact how sharp you can get the edge. The blades are then heat-treated to a 58 to 62 Rockwell hardness. Every SILVER STAG knife has North American shed antler built into the design. The Deer, Elk, Moose, or Caribou antler is selected based on the horns size, shape, curvature, weight, color, and texture. Pins and epoxy adhesive permanently bonds the antler and blade together. The finished knives are incredibly strong. Every antler handle is shaped so that the knife feels comfortable to hold and use. The antler is then buffed to a brilliant finish and the knives are sharpened by hand. Every fixed blade knife includes a high quality leather and is accompanied with a limited lifetime warranty. (Please visit The SILVER STAG web site home page to take a five minute video tour of the production process). KNIVES MADE FROM CUSTOMER SUPPLIED ANTLER – SILVER STAG will manufacture a knife using your prized antler, then laser engrave a name and/or date on the finished product. If you have an antler rack that has some sentimental value, and it’s collecting dust in your shed, send it to us. You won’t be disappointed! It will be the best $100 to $150 you ever spent.